Oddly enough, Anthem BCBS is the only carrier available for purchase on the individual market in Pitkin county (Aspen), however Anthem BCBS shows 0 total unique providers + facilities here. Anthem BCBS has 0 unique providers in Pitkin County. Anthem BCBS has 0 unique facilities in Pitkin County. Anthem BCBS has 0 total unique providers + facilities in Pitkin County. Bright has 0 unique providers in Pitkin County. Bright has 1 unique facilities in Pitkin County. Bright has 1 total unique providers + facilities in Pitkin County. Cigna has 0 unique providers in Pitkin County. Cigna has 3 unique facilities in Pitkin County. Cigna has 3 total unique providers + facilities in Pitkin County. Colorado Choice has 0 unique providers in Pitkin County. Colorado Choice has 0 unique facilities in Pitkin County. Colorado Choice has 0 total unique providers + facilities in Pitkin County. Denver Health has 0 unique providers in Pitkin County. Denver Health has 0 unique facilities in Pitkin County. 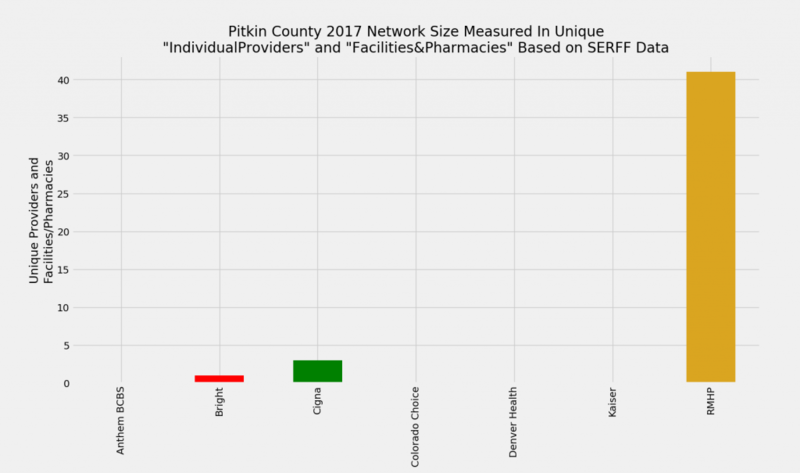 Denver Health has 0 total unique providers + facilities in Pitkin County. Kaiser has 0 unique providers in Pitkin County. Kaiser has 0 unique facilities in Pitkin County. Kaiser has 0 total unique providers + facilities in Pitkin County. RMHP has 35 unique providers in Pitkin County. RMHP has 6 unique facilities in Pitkin County. RMHP has 41 total unique providers + facilities in Pitkin County.